When I traveled for work, I’d pack my own food to bring with me. And it was super rewarding. Especially when it came to breakfast. I don’t like starting my day with a sugary processed breakfast. It puts me into a food coma. I need something full of nutrients to keep me focused and ready for the day. Maybe you’re late to work one morning. Or you have to get the children to school. This is a sure-fire way to be sure you’ve always got some health food with you. Now, of course we recommend Truvani’s NEW, organic Plant Based Protein powder. It contains 6 simple ingredients, tastes amazing, and works perfectly in this recipe. The fact that my 2 year old loves it should say everything about this product! He kept asking for “mo.” – Corinn T.
“I’d give 2 thumbs up to this chocolate protein powder – all natural, very minimal ingredients, no artificial sweeteners and yet it tasted sweet and delicious. 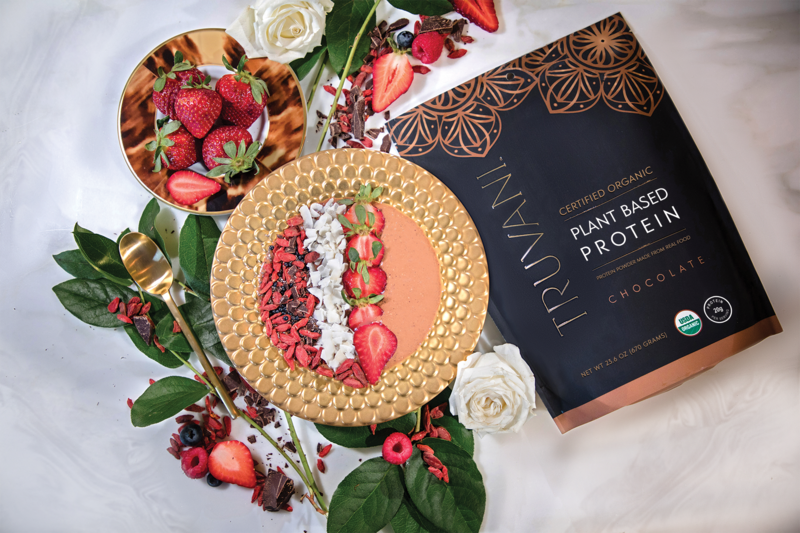 I’d definitely be happy to drink this for breakfast every morning!” – Stefani M.
“I’ve tried a lot of vegan protein powders and I am very impressed with Truvani protein powder. It tastes great, mixes well and the texture is nice. I’ve had protein powders that tasted chalky before and was pleasantly surprised to find that this one is not chalky or gritty at all.” – Melinda A. To learn more, click this link. I know it tastes great. And that’s why we also offer a no questions asked “Love The Taste” Guarantee. Meaning, if you try our Protein Powder, and dislike the taste, just email our team and refund your order. Easy. I never set out to create my own product line, but I now know that’s exactly what I needed to do to force Big Food companies to change. I’m also a realist. We must ensure we only put the best quality ingredients into our bodies, but it should feel great doing it. And that’s why taste is so important. So, try our Plant Based Protein Powder. And there’s a no hassle “Love The Taste” guarantee. If you try the protein, don’t love it, simply ask for a refund. It’s that easy. Place all of the ingredients in a to-go jar and shake to combine. When ready to eat, pour 1 cup of hot water in the jar and let sit for at least 5 minutes. Enjoy! Is there any chance that the alkalized cocoa is caffeine free and free of the effects of caffeine. I’m so sensitive to it and steer clear of anything caffeinated. I was ready to order until I saw that ingredient. I substitute with Carob powder. Hey there. I’m so excited to try your protein powder. I drink a smoothie every morning and have been searching for years for a clean product that also tastes great. I hope I find it in your product. Thanks for all your hard work. Are you planning to have a vanilla flavor or something other than chocolate at some point? I am signing up for the monthly subscription but would like to have a vanilla flavor or plain flavor as an option. Thanks! This is a fantastic idea, it sure beats packing a bunch of instant oatmeal packets with no way to prepare them and hunger creeping up an hour later! Thanks, Vani! I am a follower of your blog and love your products. Presently, I am in India visiting my sick father lost lot of muscle mass from Rhuematoid Arthritis . I was hoping this protein powder could be delivered to india. Please let me know if this is possible. I’d greatly appreciate it! would understood n hear you better WITH OUT THE BACK ground music/noise would have turned it up to hear you better but the racket would have followed . I love your blog and everything you are doing but why are all three of your products so expensive? I would love so much to get all three but can’t get past the price! Love over night oats. Easy n healthy. My grandsons love it too!! Where can I get the written recipes for the muffins and the four other recipes that you’re showing! Is it safe to use plastic baggies? What are the chances of tiny plastic particles mixing with food ? Where is the organic oats gr/own Can you specify the geography? Is the gluten from oats similar or different from wheat? I am wondering the same thing as the other user- Is there any chance that the alkalized cocoa is caffeine free and free of the effects of caffeine? I too am very sensitive to caffeine and try to avoid at all cost. I follow the ketogenic diet, a diet that is free of grains. Oatmeal is very hi in carbohydrates and can raise blood sugar levels causing inflammation. Do you have any good alternatives for the Oats. Sorry—I know this is not the question you just asked of us, and by the way I can’t wait to try this recipe! Was wondering if you’ve ever made hot chocolate with your new protein powder? I’m excited at the thought! I love doing overnight chia jars in almond milk! I wonder if I would have to blend the protein with the milk before putting it in jar to avoid any grittiness? I love the protein powder in my smoothies, but is there a recipe other than banana and almond milk for a smoothie? Thank you for creating Truvani! I am a forever supporter! I do the same but also add something for fat. At home, I add an egg and on the go a handful of nuts. It makes this a complete meal that is macronutrient balanced – carb to protein to fat. 2/3 cup of organic oats, 1 scoop protein powder (I often do 1/2 vanilla and 1/2 chocolate), and a healthy fat source like nuts or an egg if you have access. Delicious! My daughter loves it, too.